What do you make when you have some strawberries and some apples? 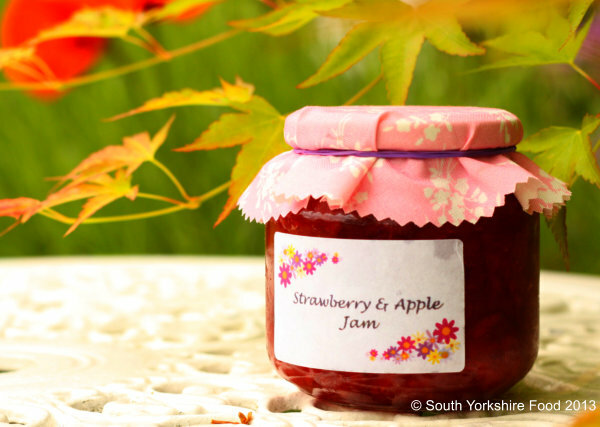 Strawberry and Apple Jam, of course! This is a fresh and sweet tasting jam, ideal for spreading on scones with some clotted cream. Makes about two 400g jars. Put the strawberries in a large saucepan and pour the sugar over them and toss them about. Add the lemon juice and bring slowly to a boil over a medium heat. Add the apples and cook for about 25 minutes. Carefully skim off any foam that rises to the top whilst it is cooking. After 25 minutes you need to test for set - put a teaspoonful onto the chilled saucer from the freezer, if the edges wrinkle slightly when tipped, the jam is ready.